Follow my plan to the T and the trophy will be engraved with your name! A bullet of sweat hits the pavement-hard. Muscles throb. My skull pounds and the drum beat in my head echoes through my body. My pulse will slow down, eventually. But that's what happens when you do sprints. It's Friday night, and I've just missed a friend's party so that I could do what? Oh, right ... work out! Training arms and doing high-intensity cardio instead of snacking on sweet, tempting delicacies while staying up late, schmoozing the social circle. That's because it's competition week. And on top of training like a maniac, I've depleted water and meticulously watched my sodium, sugar, and carbohydrate intake. I've practiced visualization, seeing myself composed and graceful on stage. And I've skipped Grey's Anatomy again to watch posing videos and routines. Tragic, I know. Was it worth the sacrifice? You decide! The journey to the stage can be a brutal emotional and physical struggle. But that's why I have a secret strategy that helps me stay afloat and skyrockets my confidence. By using the Three Ps-Planning, Patience, and Positivity-you can guarantee that no matter what decision the judges hand down, you'll feel confident, proud, and successful before, during, and after your contest. "Champions don't stay in bed." When you're training for a competition, you must plan each day's workouts and each day's meals. Make lists and stay organized. But don't beat yourself up if you don't fill in the check mark next to each "must-do" item. The point is that planning will help you prioritize so that you aren't running around like a soccer mom with A.D.D. It is possible to find a happy balance between work, training, nutrition, family, and friends. Planning has a lot to do with it, and so does the next "P". It will take more than a few days to prepare for your competition. Give yourself at least 12 weeks to 6 months. Don't grow discouraged when life doesn't fit perfectly into your training schedule. Be flexible, unwearied, and patient when family, work, or other emergencies intervene with your strict workout and diet regimen. By doing so, you might save your ego and relieve a bit of stress. Pull out the hypothetical "binoculars," and take a look at your life from a distance. The glory of being on stage-and oh, by the way it is fabulously glorious-lasts for a millisecond out of your whole life. Better spend the rest of your prep time being--oh, what is that word? Positive! This outfit may not be prime Casual Friday material, but who cares? Before a competition, you certainly won't be positive all the time. Who can be? You'll feel like a hungry, tired, cranky baby. And just as scatter-brained: "Hey, where's my binky (or keys, or cell phone)?" Cue uncontrollable wailing. That's why positive thinking, meditation, and visualization are paramount to your success. Some things that can help you stay positive: a support system of family and friends, small rewards along the way (spa day, anybody? ), progress checks, and de-stressing activities (yoga, tossing a Frisbee, a day on the beach or the river, a hike, etc). If and when you struggle with contest prep, your support systems and positive actions can help you pull through. If your "positivity tank" is on E, then find other people or other ways to fill 'er up! Contest Preparation Get all the supplements and products for your contest preparation! Don't let anything get in the way of your success! "I can't say I'm EVER confident that I'm the best athlete, have the best figure, or I'm what the judges are looking for that day. But I'm always confident that I'll present my best package, without regrets, due to my preparation." Organize your gear: make-up, suits, music, and most importantly, your mental state. Keep in mind that each competition for each organization (IFBB, WNSO, Ms. Fitness, FAP, etc.) is unique. Judges may want different body types, styles, and routines, depending on the contest. You're putty in my hands, you just don't know it yet. In fact, trying to guess what each judge wants is like trying to kill red ants in Texas; aggravating and ultimately futile. Aim for your ultimate goal and be happy with your progress. Feedback and positive criticism are beneficial, but don't let anyone deteriorate your determination or spirit. During your competition, allow some adrenaline to kick in. But don't panic while you're backstage. There's a fine line between nervous energy and stage fright. Focus on the hard work you put in to get to where you are standing. Realize that you deserve to be there, and be patient with yourself. Embrace each moment as it comes at you. Take a journal to record your thoughts and mentally prepare. Find a quiet corner to meditate, listen to music, pray or visualize. Do not stand in front of a mirror and compare yourself to all the other competitors. Of course it's nearly impossible not to, but keep a positive and confident attitude. Say to yourself, "I am what they are looking for!" Practice determination, poise, and confidence backstage as well as onstage. Endeavor to spread those feelings to the competitors around you. You can be a shining light before even stepping on the stage. And it will make your journey that much brighter. "Compete against yourself and always try to learn and improve. It is important to stay positive and enjoy the journey along the way." "The most important thing I've learned through competing is that it's not winning that matters; it's the journey. Enjoy the journey, believe in yourself and anything is possible." As soon as you arrive home from the contest, you need a plan. When is your next workout? When is your next contest? What's your new fitness goal? Write notes to self. Either on your hand (the real old-school palm pilot), your bathroom mirror (in lipstick, please! ), on Post-It notes, in iPhone messages, or any other place you run across frequently. Think of these as pre-planned pick-me-ups. You can even write these before you leave for the contest so that you have instant support. Messages I've seen: "You are a ROCK STAR!" "Few people are capable of pushing themselves as hard as you do. Congratulations, you're AWESOME!" "You are successful. You can achieve anything you put your mind to." A commitment to self-improvement will transfer to other areas of your life, and you will be a stronger, happier individual overall. 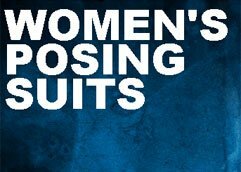 Women's Posing Suits Show off that hard earned physique and take the spotlight in a high quality women's posing suit - choose from a variety of colors! Once the big day is finito, you should give your body and your mind a break. No, I'm not advocating that you eat an entire red-velvet cheesecake from The Cheesecake Factory ... although, how good would that be? But no. Bad idea for your digestive system. Take a few days away from the gym, and enjoy some well-deserved R&R. Also, enjoy the friendships and camaraderie of others who can empathize with your journey. Maybe you met some great women at the contest? Try to keep in touch and build new friendships. Whatever emotions you experience post-contest, be sure to conduct yourself professionally. It may take some focus, but you should have the prudence not to gloat, criticize others, or make a total fool of yourself. I've seen some fascinating and selfish antics occur after competitions, which deflated other competitors who deserve to celebrate their accomplishments, regardless of placing. PRIMO PERFORMER and PRIMA DONNA. A combination of planning, patience and positivity will not only smooth your journey to the stage, but it will also make your time in the sun more enjoyable. With one good experience under your belt, you'll be itching to get up there again. And no one is going to stop you. SG2Victory 'Little Gem' Show Notes: Fitness, Figure & Bikini Contest Tips! Art Of Figure Presentation: It's All In The Details! Tiffany realizes the significance of role models and mentors and strives to represent the importance of fitness as well as a diversified lifestyle.